How do I know if I am in your service territory? What does lot size mean, and how does that help determine my price? We base our prices on the size of your lot in square feet, before improvements. We make no adjustments for pools, landscaping, etc., despite the fact that these items actually increase the time required to service your lawn (due to the additional edging and line trimming, which require much more attention to detail than open mowing). We price using this method, providing you with the simplest, most transparent method out there for taking care of your lawn service needs. How do I find the size of my lot? If you don’t know your lot size visit the Pinellas County Appraiser’s Office website. Once there, you need to elect to “Search Our Database” from the menu options on the left. You may find your home either through Owner's Name or Property Address. Once you have the property information page, look under the section entitled Land Information and then in the subcategory, Land Size. Simply multiply the dimensions and arrive at your square footage, and then search our table to find the appropriate size and charge for your property. We will of course confirm this by doing the same. Watch a tutorial on how to calculate your lot size. The recurring payment plan option allows Paypal to draft your designated payment source in accordance with your selected subscription plan. Timely payment allows us to offer the most affordable rates and plans AND offer ‘No Contract’ service options. Through your Paypal account you can also very simply select and manage your payment source and elect to cancel your service at any time. On Pay-As-You-Go Plans you are only liable and committed for the billing term in question, a 4-week interval. There are no refunds or pro rata payments. Annual Service Agreements have their own terms and conditions. View Annual Service Agreement terms and conditions. View our refund policy. Because PayPal administers your payment plan and we receive payments in a timely fashion, we can offer a “No-Contract” plan option, allowing customers to order service simply when they need it, cancelling with only a 4-week commitment. In winter months we adjust your payment in accordance with the number of cuts we intend to perform based on our stated cut schedule, weekly April - September, bi-weekly October - March. All card/bank data is stored and processed securely with PayPal. You can enroll today, elect recurring billing, and never have to worry about cutting your lawn, or making a payment to us again! How does the Pre-Paid plan work? The Pre-Paid Plans are very straightforward. As they sound, in exchange for your prepayment, we pass along varying levels of savings to you, enabling you to earn 1, 2 or even 3 months of FREE service. Making a Pre-payment effectively lowers your average monthly cost. The bigger the upfront payment the greater the savings over time. But here is the best part: With PayPal Credit, you can check out today, enjoy the savings, and STILL make your payments over time, by simply paying off those charges in installments at a great rate available to you through Paypal. * Just remember to elect PayPal Credit at checkout as seen below. *Current promotional rates include No Payments and 0% interest for 6-months, if your balance is paid in full. 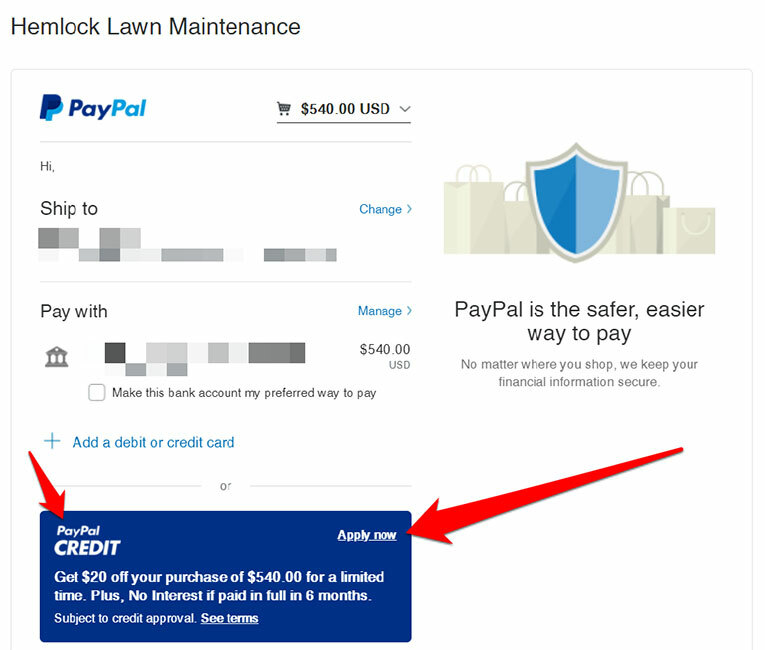 Learn more about PayPal Credit. OK! That looks great! Now what? How do I sign up? Simple! Click the button and select your desired plan, and then make your payment by following the simple steps. Please make sure to leave the property address you wish to have serviced in either the “Ship To” area of your payment, or under the election for “Special Instructions to the Merchant”. Often times, people have elected billing addresses that do not correspond to the address at which they currently reside. Additionally, for security reasons, addresses are often times blocked from us, the merchant. In order for us to service your property, you must please alert us of your address. You may do this by placing it in one of the two fields referenced above. If we cannot verify the property address we are to service, or if there is any confusion, we will contact you via email. We will also verify that you are eligible for the price point you have elected by confirming your lot size. What if I’m not comfortable making an online payment? If you are electing to Pay-As-You-Go we require a recurring bill payment plan, and we can set you up over the phone as a simple alternative. While PayPal is our preferred method for receiving electronic payments, we can accept a credit card over the phone. We are proud to offer PayPal as an eco-friendly alternative to traditional paper invoices. Save money, save paper, save postage, and do your part to save the environment. Use PayPal and enroll today. How and when do you bill me? If you requested a recurring payment plan, funds will be drawn from your Paypal Account in accordance with the terms and conditions to which you have agreed. Your receipt for our transaction will be available in your Paypal Account Summary. Funds will be drawn once monthly on the anniversary date of your election. What credit cards do you accept? Do you handle checks? You may pay with any credit card type supported by Paypal. That will include Visa, MasterCard, Discover, American Express, etc. You may also be eligible to pay with funds from your bank, if you have so elected with PayPal. We also take checks. We are also now pleased to offer PayPal Credit, a financing solution from PayPal. Where is my credit card information stored and processed? Is it safe? Are credit cards your only accepted form of payment? No. We accept old-fashioned checks, but only if we have a credit card on file. We can also make arrangements for other methods of payment. But quite honestly, these methods are the easiest. Save money on postage, and make sure you never pay a late fee. Pay with PayPal and help reduce the need for more paper. Are there any other fees that I could encounter, or come to expect? The nice thing about our Pay-As-You-Go Service, is that with a recurring payment plan, there is no Termination Fee, and you may cancel at any time. If for any reason, your payment should fail, we will invoice you to collect the money due before we can continue with service, and work to straighten out your recurring payment profile. If for any reason, that secondary payment attempt is delinquent or presents a problem, the only other fees you will incur are outlined below for declined or failed transactions and late payments. We recommend and administer the recurring payment plans to avoid all these unnecessary charges, and allow for “No Contract” lawn service. It is extremely difficult scheduling our business concern when we allow customers to come and go as they please. Therefore, we require the recurring payment option for customers of this Plan. If for any reason a card you choose to use is declined, or a check is bounced, you will be charged a $35 fee. If we should extend additional services and/or allow an alternate form of payment, then any late payment will be assessed a Late Fee in accordance wit the table below. Our Annual Service Agreement has it’s own terms and conditions and schedule of fees. See our Annual Service Agreement. What if I have an additional service request, like hedges that need to be trimmed? Alert us, we will perform an estimate, and bill you electronically. Make your supplemental payment, and we will complete the work. Do you offer landscaping or other services? Yes, please see our landscaping page for more info. If my lot is overgrown is there a surcharge to come and cut it down to size so that I can take advantage of your great lawn service package? Invoice you for any supplemental charge, and complete the work when it is paid. Continue to invoice you in future months under the same general terms and conditions set forth here for general lawn service. If you don’t like the fee associated with the cleanup, and you have already elected a service plan option and made a payment, you can simply decline our service and we will refund any money already paid. Simple as that! If you have elected service with a recurring payment option, you may cancel your service and stop any future payments through your account with PayPal. Simple as that! As a professional courtesy, we ask that you also send us an email alerting us of your desire to cancel service. We will then remove you from our route. If you have elected to pay as you go, and we do not receive payment from you, and reminder alerts are ignored with no contact, we will simply cancel your service, and any attempt at reactivation will probably be turned down. We do our best to service everyone. We only ask you work with us to make things as easy as possible. If you have an Annual Service Agreement, other terms and conditions apply. See our Annual Service Agreement. All sales for our Pay-As-You-Go and Pre-Paid lawn service plans are considered final. We do not offer any refunds. You are not under any long-term obligation for our Pay-As-You-Go Plan, and there is no termination or account closing fees with that service option. You may elect to cancel your service at any time. But any payment made is considered final. Although we endeavor to charge by the cut we are not able to pro rate or refund any service visit missed as a result of an Act of God. Florida weather can be tricky. If we miss a scheduled service we come back to face significantly more work the following week and thus do not offer a refund or rebate for events beyond our control. Service visits missed are rare, but can occur. Lawns that become deeply saturated from extensive rain can become damaged if we attempt to cut simply to earn our keep. Hurricanes can also adversely effect our schedule. As you are under no long term obligation with these plans, we strive to earn your business. We just need to state our policy up front so it is clear for everyone. I am having a problem with a technical aspect on Hemlock Lawn, or one of the external websites, and cannot process my request. Can you help me? If you are having a technical problem you cannot resolve, , and we will see if we can solve it for you. This website contains links to third party web sites. These linked sites are not under the control of Hemlock Lawn Maintenance nor is Hemlock Lawn Maintenance responsible for the contents of these linked sites, or any subsequent links to additional sites or a linked website. Hemlock Lawn Maintenance includes these links as a convenience for site users. The inclusion of any link does not imply any association, partnership, affiliation or endorsement of any kind. I have a question I don’t see on your list. Can you help me? Yes! Please see our contact page to email us your question.